Synopsis: After his parents are gunned down when he was a child, Bruce Wayne undergoes intense training and becomes a superhero known as Batman and begins to wage war on the criminals of Gotham. Review: If one was given the task of describing this film in one sentence, it would be: the film that is the rebirth of a franchise that died in 1997. 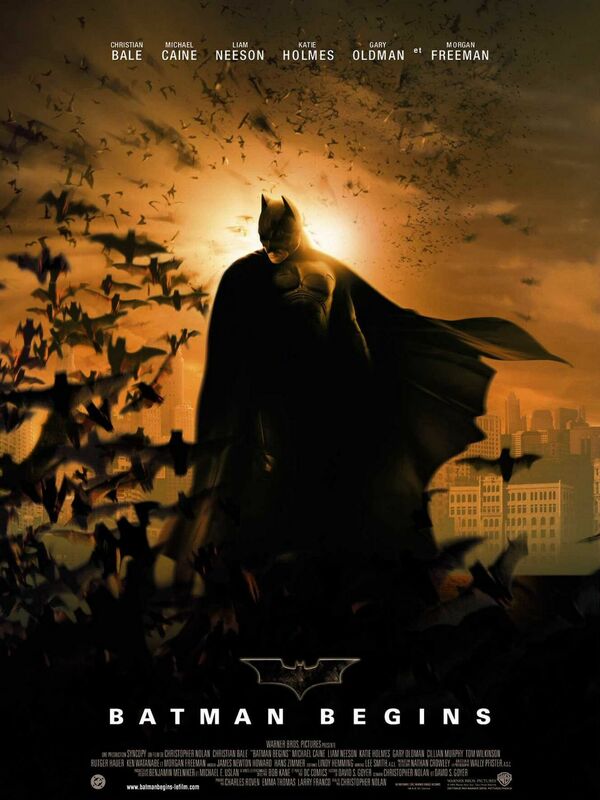 As it is an origin story, it really excels in giving Batman a great deal of character development and depth that we have almost never seen on the big screen before. We understand what ultimately drives Bruce Wayne to bring about an end to the evil and corruption in Gotham. After his parents were murdered by a mugger, he becomes an angry individual and he becomes determined to eradicate the crime underworld that Gotham has been entrenched in for many years. In the early stages of the film, Bruce endures training under the eyes of Henri Ducard (Liam Neeson) and his master Ra’s Al Ghul who recruit him into the League of Shadows. Under their tutelage he becomes a very skilled warrior. However, he ultimately becomes their enemy and returns to Gotham to become a symbol of hope. To do this he fights crime in order to bring Gotham back from the mire of damnation. With the help of his trusted butler Alfred (Michael Caine) and the brilliant Lucius Fox (Morgan Freeman), Bruce gets the equipment he needs in order to eliminate the crime and evil that lurks within Gotham. However, Ducard returns as the League of Shadows, together with the work of the evil physicist Dr Jonathan Crane, also known as the Scarecrow return with a plan to destroy Gotham and Bruce under his new alias must stop them. The film is packed with some intense action sequences including a sword fight on a frozen lake and a high speed car chase over Gotham’s rooftops that will keep the viewer glued to the screen with excitement and anticipation. But the action although entertaining is a secondary element of this film, the focus on the titular character is the centrepiece of the film and this is what drives it onwards. Many of the actors in this film give some great performances. Christian Bale was outstanding in both his roles as Bruce Wayne and as Batman. We see his pain and his drive to become a great force for good in a city that is crawling with the evil and the corrupt. Similarly we see his anger and ferocity when he puts on the cape and mask. Liam Neeson also delivers as Ducard as he comes across as a good guy in the beginning but is quite the opposite at the end of the film. Morgan Freeman and Gary Oldman really deliver in their roles as the scientist Lucius Fox and the cop Jim Gordon, both of whom are two of Batman’s closest allies in his fight against evil in Gotham. Katie Holmes plays Rachel Dawes, Bruce’s love interest. While their on screen chemistry is a little lacking at times, she also delivers in her role as Gotham City’s assistant District Attorney. Michael Caine who plays the Wayne family butler Alfred also gives a strong performance. He provides support to Bruce when he needed it most and also gives some comic relief moments that add a little bit of humour to an otherwise very dark and gritty superhero film. All in all, Batman Begins does what it set out to do very well. It explores the character many of us know and love in great and almost unprecedented detail. On top of that, it boasts some excellent action sequences and some humorous moments, along with an excellent villain. It was the film that rescued the Batman franchise from the doldrums of the film industry and restored it to one of the best superhero franchises in existence. For that, Christopher Nolan deserves a huge amount of credit. Well acted by all with a tremendous lead performance from Bale, the Dark Knight returned triumphantly back onto the big screen and the superhero radar.